Revenue in the Food market amounts to US$3,776,684m in 2019. The market is expected to grow annually by 4.4% (CAGR 2019-2023). The market's largest segment is the segment Milk Products with a market volume of US$674,866m in 2019. In global comparison, most revenue is generated in United States (US$683,086m in 2019). In relation to total population figures, per person revenues of US$513.12 are generated in 2019. The average per capita consumption stands at 179.5 kg in 2019. The Food market includes all processed foods which have been prepared or preserved in some way. Unprocessed foods such as fresh fruits and vegetables are not included here. Food represents a significant part of household expenditure, but its relative importance compared to other products decreases with increasing income. The four highest sales volumes are seen in the following segments: Meat Products, Dairy Products, Baked Goods and Confectionery. The leading brands in these markets are produced by the large multinational consumer goods companies, Nestlé, Unilever and Danone. Reading Support Revenue in the Food market amounts to US$3,776,684m in 2019. 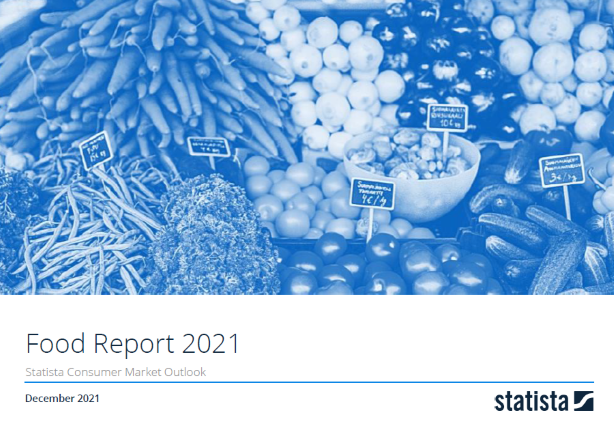 Reading Support The Food market is expected to show a revenue growth of 5.5% in 2020. Reading Support The average revenue per person in the market for Food amounts to US$513.12 in 2019. Reading Support In the market for Food, volume is expected to amount to 1,436,020.3 mkg by 2023. Reading Support The market for Food is expected to show a volume growth of 2.4% in 2020. Reading Support The average volume per person in the market for Food amounts to 179.5 kg in 2019. Reading Support The average price per unit in the market for Food amounts to US$2.86 in 2019. Reading Support With a market volume of US$683,086m in 2019, most revenue is generated in United States. Here you can find more studies and statistics about "Food".